United States President George W Bush says America is involved in a diplomatic showdown with North Korea, not a military one. Taking time out from a New Year break at his Texas ranch, Mr Bush said he believed the dispute over Pyongyang's decision to restart its nuclear programme could be resolved peacefully. South Korea is also pinning its hopes on diplomacy and Deputy Foreign Minister Lee Tae-shik has arrived in Beijing, seeking support from China - a traditional ally of Pyongyang. North Korea said on Tuesday it had no choice but to reopen its reactors, because the US was planning a pre-emptive strike against them. Pak Ui-chun, Pyongyang's ambassador to Moscow, was quoted by Russian news agencies as saying the US had followed moves to cut off fuel oil supplies to the energy-starved state by "threatening us with a preventative nuclear strike". 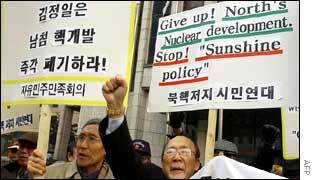 "In these circumstances, we also cannot fulfil the Non-Proliferation Treaty," he added. Correspondents say this is the clearest indication yet that the secretive state may pull out of the key nuclear non-proliferation pact, which it signed in 1985. "One of my New Year's resolutions is to work to deal with these situations in a way that they're resolved peacefully," Mr Bush said of the growing crises in Iraq and North Korea. Asked why he was prepared to go to war with Iraq, which may not have nuclear weapons, but not against North Korea which does have them, Mr Bush said diplomacy was the better tactic to adopt with Pyongyang. "I view the North Korean situation as one that can be resolved peacefully through diplomacy," he said, while adding that "all options, of course, are always on the table." The BBC's Charles Scanlon in Seoul says South Korea is trying to get support from Russia and China, both of which are seen to have some influence over North Korea. He says it is hoped that Pyongyang's old allies will play a more active role in trying to persuade North Korea to halt its nuclear programme again. Seoul is planning to send an envoy to Moscow later. In the latest signal of difficult relations between the US and South Korea, thousands of protesters in Seoul saw in the New Year with another mass rally against the US military presence there. The last United Nations nuclear inspectors left the country on Tuesday morning after Pyongyang ordered them out last week. An International Atomic Energy Agency spokeswoman said the agency regretted the expulsion, but hoped to return to North Korea. Pyongyang ordered the inspectors to leave amid an escalating stand-off over its plans to revive a mothballed nuclear complex at Yongbyon, 90 kilometres (60 miles) north of Pyongyang. Inspectors had been stationed at Yongbyon for the past eight years, monitoring nuclear activities at the complex - which experts say is capable of producing weapons-grade plutonium. "Hopes now rest with a diplomatic solution to the crisis"
"The current administration may be less likely to bargain"